I have always been a foodie... Though until 2001, being a foodie meant enjoying delicious meals cooked by Aai (Mom) or Aaji (Dadi) or on very rare occasions - my brother. My cooking knowledge was limited to Chai, Maggi and not much beyond that. I remember my Aaji was really concerned about my (non-existent) cooking skills. Aaji would say to Aai - "At least teach her some basic meals like daal-rice. She really doesn't have a clue about cooking." - "Aga, tila jara pithala bhaat tari karayala shikav.. agadich kahi yet nahi tila." Aai (my mom) would always respond with the same answer: "She will be fine! Anyone who likes to eat tasty food cannot be a bad cook." Grind the chutney ingredients into the chutney. Don't remove the chutney from the grinder vessel yet. Heat oil in a small pan. To this hot oil add all the tadka ingredients and let the mustard seeds splutter. 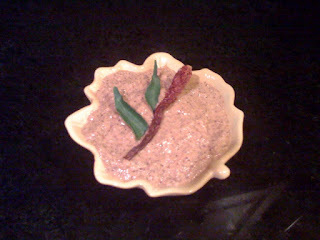 Pour this tadka over the chutney and grind it again till the tadka gets completely mixed with the chutney. This tadka trick works for a lot of chutneys. Serve with your favorite South Indian snack - Dosa, Uttappam, Vada, Idli or Adai. Nice recipe..will try it out..